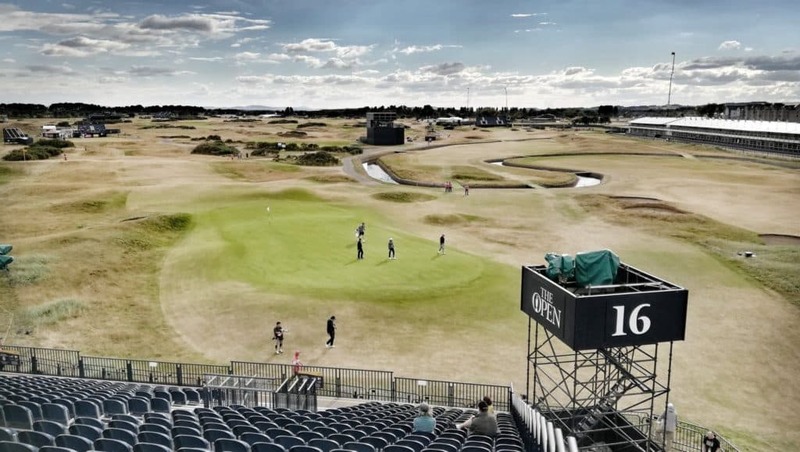 Golf’s oldest major championship returns to Carnoustie for the first time since 2007 and is ready to live up to its name as one of the world’s hardest golf courses. I don’t make that claim lightly. I could lazily make this statement based on a few google searches on “world’s toughest golf course”, see Carnoustie on nearly everyone’s list and hope you all find me credible enough to just take my word for it. But when mapping out the course on Google Earth, over and over I kept thinking to myself “holy s**t, this course really is is f***ing hard”. There’s so many ways Carnoustie can fluster the most talented golfers in the world. For one, the course is completely exposed to the elements and offers no protection from the winds. And when the winds get up, the course can be nearly unplayable. We saw that in 1999 where winds were 15-30 MPH all week, causing the cut line to be +12 and yield a winning score of +6 (and allegedly send Sergio Garcia back home to sob in his mothers arms). 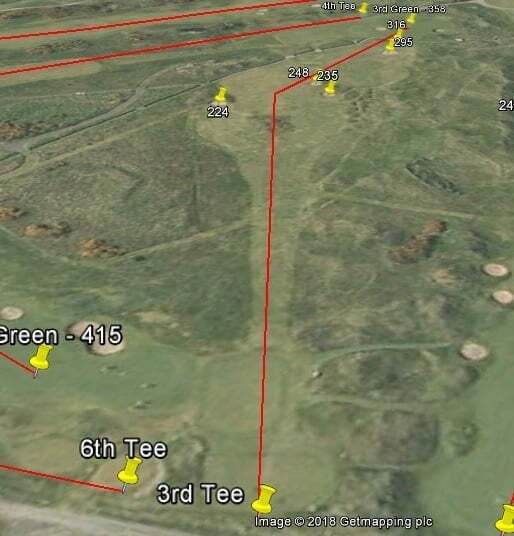 The layout of the golf course also isn’t the traditional “out-to-in” style like at most Scottish Links courses such as St. Andrews and Royal Troon. 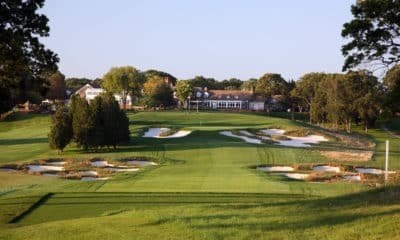 At those tracks, the golfers see fairly consistent wind directions for most of the front nine as the holes are laid out in the same directional track, before turning around and heading in at the opposite wind direction back to the clubhouse. At Carnoustie, there is more of a variety of tee-to-green directional layout, meaning the golfers will have the challenge of trying to gauge the wind from different directions hole to hole (including dreaded crosswinds). This will up the difficulty should the winds pick up. The wind direction might make the decision easy for most players – when the prevailing winds are coming out of the SE/ESE, attempting a 316 yard shot over the burn is reckless. But if the wind is coming out of the SW (like what’s supposedly in the forecast for Thursday through Saturday), several golfers are going to be very tempted to take on the burn in front of the green. But even the so-called “safe shot” is no bargain either. Most players who take an iron off the tee will need to carry or navigate around the far bunker up the right side 250 yards out (no easy task for the shorter hitters). Even if they play it away from the bunkers, they’ll flirt with the burn that borders the left side of the fairway if the ball comes off a bit hot off the turf. Several holes on the golf course are like this. There’s truly no safe shot. Every shot, whether they go for glory or lay up, carries a material degree of risk. This year’s Open will not only be a test of skill but of mental fortitude (which is exactly how Carnoustie likes it). For a gambler, it’s very important to critically evaluate the golf course and how it will play before putting down any bets. And if the major has been played at the course recently, it makes it much easier to gauge the keys to success. Unfortunately, neither tournament that was played in 1999 and 2007 will resemble anything like how the 2018 Open Championship will play. As mentioned previously, the winds in 1999 were absolutely brutal and the golf course saw quite a bit of rain in the weeks leading up to the tournament. In 2007, the wind wasn’t quite as blustery until the final round and yielded lower scores, but wet conditions yet again allowed for Carnoustie’s famous rough to flourish and punish anyone who couldn’t find the short grass off the tee or on their approach. On this week’s ShackHouse Podcast, Geoff Shackelford alluded that Rory McIlroy was thinking about going against the grain and try to bomb and gouge Carnoustie. There is a bit of logic to this – the famously thick rough at Carnoustie shouldn’t have nearly as many teeth as normal because of the lack of moisture over the last few months. We kind of saw this at Hoylake in 2014 when he boat raced the field. Hoylake featured whispy, thin rough like Carnoustie will have this week, and that allowed Rory to hit his favorite club, the driver, on most holes. Even if he sprayed it a bit, he was able to get good contact on the golf ball out of the rough. His irons were so locked in during the summer of 2014 that he piled on birdie after birdie on his way to capturing the Claret Jug. I’m not a proponent of this strategy this week. For one, the super dry conditions are going to cause the ball to roll out even on errant shots into the rough. Sending a drive out into the rough without a care in the world might lead to some incredibly unfortunate bounces and give him some very awkward approaches and angles into the green for his second. Plus, clubbing down will still yield 300+ yard shots off the tee and dramatically shorten up the golf course. It’s better to have a full swing iron off the fairway than a shorter, awkward distance from a less than ideal lie. An interesting wrinkle at Carnoustie will be the contrast of speeds between the fairways and greens. While the fairways and areas around the green will be lightning fast and bouncy, the greens have been well maintained and watered and will run very slow. Carnoustie typically likes to keep its green speeds between 10 and 11 on the stimpmeter, which is much slower than most majors normally run. But even with the slow greens, the lack of moisture still firmed up the surfaces and will make it difficult for the golfers to get much spin to hold greens. Overall Ball-Striking: Over the last five years, the average ranking in Strokes Gained Tee-To-Green of players in the Top 10 was 46.4 and a median of 33. 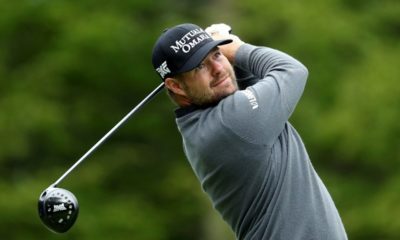 This statistic sometimes doesn’t include prolific ball-strikers like Henrik Stenson or Lee Westwood, who’ve seen a tremendous amount of success at Open Championships over the last five years but hadn’t accumulated enough rounds on the PGA Tour to qualify. Like the U.S. Open, the Open Championship rewards consistency, patience, and the ability to avoid trouble while also rewarding the best ball-strikers in the world with strong finishes. Therefore, Strokes Gained Tee-To-Green should be used in all gambler’s consideration this week. Off The Tee: There will be spots this week where players will be tempted to pull driver (especially when the wind is in their favor). However, most players will probably settle for an iron off the tee and letting the firm turf do the rest of the work. Because of the fast conditions of the fairways, though, distance control will be key to avoid letting the ball run out into the burn or through the fairway into a bunker. If the ball does run out into the rough, however, it won’t be nearly as penalizing as years past. To assess prowess off the tee, you could use Strokes Gained Off-The-Tee as a metric, but that statistic primarily measures performance with the driver. This week should make that metric a bit meaningless. While I won’t completely ignore off-the-tee statistics if someone is struggling in that area, I won’t be using it to make a case for anyone either. If anything, gamblers may need to do a bit of digging on which golfers are more comfortable and prolific using driving irons off the tee. Approach Shots: The ability to have distance control on approach shots through tough winds is most often the best defining characteristic of what it takes to be successful at the Open Championship. So Strokes Gained on Approach will be a key statistic to look at as well. But with most golfers being able to far surpass their normal driving average off the tee, it should significantly shorten up 7,400-yard track. It might be beneficial then to try and hone down on the possible ranges of approach shots to better identify stronger players in those areas. 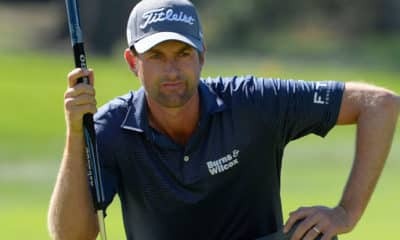 Most successful golfers this week should be able to hit the ball out at minimum 300 yards with roll (assuming they keep it in the fairway) even if they just take an iron off the tee. That should make most approach shots into the greens under 150 yards (with a few holes under 100 yards and in). Because of that, I’ll try and focus on golfers who typically score well with wedges and high lofted irons from 150 yards and in. Around The Green: This is an area I tend not to focus a lot of attention on. When looking back at most tournament’s history, I seldom find a strong correlation between success or failure in scrambling and tournament performance. This week, however, I expect to scramble to be a vital part of success at Carnoustie. For one, it’ll be very difficult to hold greens with how firm and bumpy they will be. Not only will it be difficult to get enough spin on a golf ball to hold it, but one wrong bounce could send it careening well off into a collection or waste area. And depending on how hard the winds blow, it will present quite a challenge for the golfer to keep their approach on the proper line. I’m going to put a greater emphasis on performance around the green in my analysis this week. Not only will I look at Strokes Gained Around the Green, but I’ll also look at scrambling % from the bunkers and in “other areas” (normally defined as from the fairway or non-fringe tight lies). Placing a larger emphasis on scrambling statistics also will help on holes where golfers have no more than 50 yards into the green for their second. Putting: The general rule about putting is this – on faster surfaces, it levels the playing field and makes it more difficult for all (meaning it reduces the variance between poor putters and good putters). On slower surfaces, however, better putters tend to rise to the top and have an advantage over weaker putters. Though the R&A may try and speed up the greens through the week, they should still run on the slower side. Therefore, putting performance should be taken into account on identifying contenders. Friday PM: Cloudy, 64 degrees, Winds 10-18 MPH, slightly subsiding early evening. If anything, guys who go out very early on Thursday have a slight edge to put up a good score before the winds pick up through the day and make the course much tougher. Once we hit about 10:30-11 AM BST, the conditions should be the same for pretty much everyone the rest of the day. On Friday it looks like everyone will face the same conditions with a slight chance someone teeing off late could post a nice score on the Back Nine (though they’d have to do it on the toughest part of the golf course in holes 15-18). Therefore, I’m slightly leaning on favoring guys on the Thursday AM/Friday PM draw to get off to good starts, but because the advantage isn’t that strong I’ll primarily be using it to break ties between two players. Coming up tomorrow – picks to win the 2018 Open Championship, my favorite props and head-to-head matchups of the week.